The Fitbit Zip is another clip-on tracker and is one of the first attempts on the fitness tracker world from the Fitbit family and just like the Fitbit One was first released in 2012. Let’s say that today in 2018 the trackers have evolved quite a bit, so there still a need for the Fitbit Zip? So the basic version can’t help you with sleep patterns or track your steps on the treadmill. But if you just need a device that will track your steps and calories burned, and can sync wirelessly with Fitbit’s website and smartphone apps, the Zip is a good choice. With a lot of the same features that come together with the Flex like the computer and phone connectivity, but the difference is that the Zip comes with an LCD display with a clock and the Flex can track your sleep and has a silent alarm function. So without further ado let’s go for the in-depth review of this old but still on the market Fitbit Zip. So you want to get in better shape, but don’t want to spend too much for a fitness tracker. The Fitbit Zip is a low-cost, entry-level device that clips onto your belt and measures your daily steps and calories, and can integrate with a number of third-party apps. Overall, the Zip is a good tracker for an entry-level fitness enthusiast, although it’s not our top pick in this price range. The Clip-On design is not that common in today’s market so having a tracker that won’t call attention and can disappear inside a pocket is a pretty good thing for those that would like to not have a smartwatch on their wrist. The body of the Zip is slightly rectangular with rounded edges. The tracker is available in 5 different colors and you can buy Exchangeable clip holder on Amazon to have more options with the same tracker and the best part is that a pack of 3 cost $12.69 only!. The original colors are Blue, White, Black, Lime Green, and Pink. The measurement of the Zip is 1.4 x 1.1 x 0.38-inch, when it comes to weight the Zip weighs 0.25 ounces on its own, and 0.55 ounces with the belt clip on. The Zip is splash-proof, meaning that you can get some drop of water, but the company advises against taking it inside the shower or the pool. If you press the tiny display on the Zip, you can cycle between the time, your steps and miles as well the calories you burn. A cool thing from the Zip is that it has a friendly smiley face that appears to give you a general indication of how close you are to achieving your goals for the day. Another plus from the Zip is that you are going to feel encouraged to exercise more, besides the friendly face, the tracker will give you different badges depending on how well you are doing, like if you finish 10,000 steps in a day or log your first 50 miles walked. There are some really cool things about the Zip like it will encourage you to exercise if you are open to it. It awards little badges – taking 10,000 steps in a day or logging your first 50 miles walked to keep you motivated. The Zip requires a Bluetooth 4.0 connection to sync its data, which means that you need a phone with Bluetooth functionality, but with an iPhone 4S or any Android device with 4.4+ you are good to go, so most phones out there can be a good fit. As well, the Fitbit includes a Bluetooth dongle, so you can sync this fitness device with your notebook or PC. It’s a pretty cool feature since you will never have to sync anything, but your steps are just there. When it comes to where to use the tracker you can slip it in your pocket, your belt, your collar, or pretty much anywhere, and it will start to track your movements. The Zip comes with the regular Fitbit app that comes with all the tracker from the company and it will give you at a glance the number of steps and miles you walked, as well the active minutes and calories you burned throughout the day. The tracker will also show the calories that you have eaten and water that you have consumed, but you will have to add that data yourself. Each of these categories will allow you to get down further giving you graphs and charts so you can check your progress over time. By using the Web or mobile Fitbit app, you can also check and track your weight, body fat percentage, as well add any extra exercises that you’ve done throughout the day. If you are into losing weight you can additionally perform even better by having the Fitbit Aria connected scale ($129) that will send the information directly to the app, you can also add the data yourself by using the scale and body fat meters that you may already have. Making use of each of these additional categories gives you additional ways to manage your overall health and activity so you can achieve your fitness goals. You May be interested in: How to lose weight with Fitbit. So now you are ready to go online to your Fitbit.com account. You must log in from your computer or mobile device to view and enter all your recent fitness data using the online dashboard or the Fitbit App. You need to manually log in the start time and duration of activity workouts (like swimming, cycling, tennis or yoga) where the step counting may not be as accurate as you need. By logging your data manually you create a good habit that also comes in handy in case you forgot to clip on your Zip, you can just add the distance you walked or ran. Although the Fitbit Zip does not track your heart rate, you can also manually add your resting, normal, and exertion heart rate, as well your glucose and blood pressure stats. By having the possibility to log in your food intake you will have a great companion to customize your weight loss plan. It calculates the number of calories you should eat each day to reach your goal weight and then depending on your activity level for the day, it adjusts the amount. So if you’ve had a really active day, you are allowed to eat more to make up for the calories you’ve burned! At midnight of the time zone you selected in your profile, the Zip will reset automatically to zero. But the data you have on your tracker will not be deleted. Next time you sync your Zip. the data will be transferred to your online dashboard and mobile app. The Zip uses a MEMS 3-axis accelerometer to record your movements. which basically means it is able to measure your movements in any position, vertically, horizontally, etc. that the tracker is worn. The device is fairly accurate, as it measured a 0.81-mile walk as 0.71 miles. Probably you will be using the Zip to get a general track of your overall health, instead of a super focus and accurate count of your workouts. If you use the Zip as recommended by Fitbit, the accuracy rate for counting steps should be 95 to 97% according to the company website. Customer reviews indicate overall satisfaction with its step tracking accuracy. For other activities such as yoga, cycling, Zumba, swimming, stair climbing, and workouts on stationary exercise such as the treadmills or stationary bicycles, the Zip may register actual steps but the accuracy may be lacking. On the other hand, the accuracy of the tracker may improve depending on where you wear the Zip. A great number of users have reported better accuracy when they use the tracker in their sock or tied to their shoelaces while exercising on the treadmill, stationary bike or stair climbing. This is a real plus for the winter time when is harder to go outdoors to workout. However, the best choice will be always to manually add the time of your activity or workout on the dashboard or mobile device app and the Zip will calculate the number of calories burned based on your activity level and the height, weight, age, and gender among other information you entered in your initial personal profile setup. More activities completed and entered will also enhance your activity level and the friendly emoticon will smile to you as a sign of approval. Unlike other Fitbit trackers, the Zip does not track your sleep patterns. But we found out that some people use the tracker on the waistband of their pajama and got data on their sleep movements. The Fitbit Zip uses a non-rechargeable lithium coin battery that the company says will last between 4 and 6 months, and when you need to change the battery is pretty cheap to get a new one, in Amazon you can get a pack of 5 batteries for less than 5 dollars! When you buy the Zip it comes with a tiny battery opener, you can also use a coin to get the battery out. You only need to be sure that after installing or replacing the battery have the numbers are facing up. Is best if you already have an extra battery on hand as there is not much notice given before the battery runs dry but not to worry, any tracked data will not be lost if it does. In case you have any problem with a very short battery life, you need to make sure you have installed the latest firmware updated version. To be sure you can go to the Main Menu of Fitbit Connect and click the Check For Device Update. To get the most from your battery the tracker will be in sleep mode during periods of inactivity. The Zip will get in sleep mode after 20 seconds if it there no movement going on. Once the tracker is asleep, the display will stay off until movement is perceived. When the has drained to 25% you will get a battery icon letting you know that you are getting close to run out of battery life. You can also check your battery level by logging into your dashboard. In case your data is not synced before replacing the battery you will lose your statistics, so be sure to do it before you need to exchange the battery. 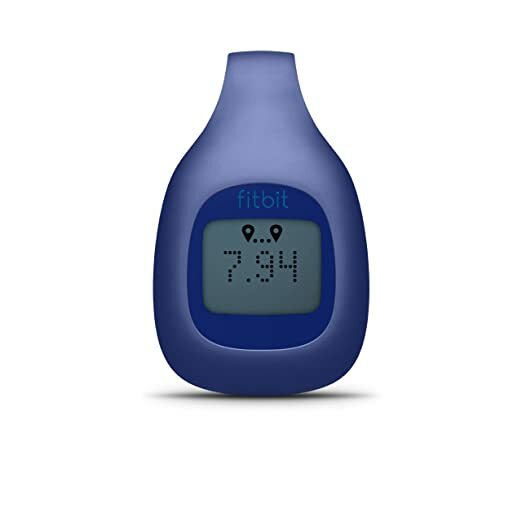 For a basic pedometer with computer and smartphone connectivity, the Fitbit Zip is a decent buy. And if well the battery is replaceable and not rechargeable, it is very inexpensive with a pack of 5 selling for about $5 on Amazon. Simple and easy to use, the Zip’s appeal reaches out to both old and young audiences as well it goes well with tech geeks and the less techy folks. The Fitbit tracker as great choices for those that need some motivations to take their first step to reach their fitness goals and Fitbit excels in the motivational aspect due to their online performance feedback and social community interaction. Fitbit claims on their website that users average 43% more steps daily. With the Fitbit Zip, they added the friendly emoticons to give you an extra push. Have an active day and the Fitbit Smiley will look back at you approvingly. Have a lazy day and risk the wrath of the Unhappy emoticon sticking its tongue at you! We like this tracker’s lightweight and small LCD screen. But in 2018 there’s a lot of trackers that can do a lot more for the same price that the Zip is available today. However, if you have other Fitbit devices, such as the Aria scale, or use other apps to track your activity, the Zip may be a good buy.